What Has Shaped Your Leadership Purpose? There are a myriad of styles, methods, theories, and examples of leadership, and those that resonate most with us often do so because of how they connect to our experiences. In our leadership development, we are shaped by our past experiences and influences and by what we choose to learn, which in turn has a great effect on our purpose and on how we lead. In your own practice, what do you think has helped to shape your purpose, and in turn, your leadership? Please share in the comment box below. Finding Purpose at the Intersection of Passion, Ability, and Opportunity is a book I originally wrote almost ten years before it was published (I even went so far at that time as to apply for a copyright and submit the manuscript to a publisher). However, much like what happened with the rebuilding of the temple described in Ezra 4 and 5, God – in His divine sovereignty – saw fit to put a stop to the process until the time was right. It seems He still had more to teach me on the matter. Now, I know that I will continue to learn and grow for the rest of my life, and I also know that “the more I know, the more I know I don’t know,” which means if I waited until I have full and perfect knowledge, this book would never have happened. And so eventually I reached a point in time when God prompted me to pick up where I left off and re-engage, and – with some revising and additions to the original – to publish. 3) Opportunity – circumstances that occur in my life. It is these three lines in our lives – passion, ability, and opportunity – that, when they intersect, form the point where we find the greatest fulfillment and contentment, with a certainty that we are where we should be. Picture a geometric graph, with three separate lines, one representing our passion to do or be something, one representing our talents and abilities, and one representing the opportunities that appear before us. At some place on this graph these three lines intersect at one specific point. This is the place where we find that we are doing something that brings us joy and that matches our talents well. These concepts first came together in my mind while facilitating a student retreat quite a few years ago, and over the time since, I have seen them applied in my life many times and in many ways. God has placed opportunities in front of me that matched my passion and abilities in ways that have allowed me to be His instrument while finding fulfillment in my work. My prayer for you would be that you would identify these three factors in your life and find your purpose. 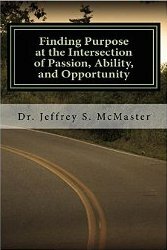 To order a copy of my book, Finding Purpose at the Intersection of Passion, Ability, and Opportunity, on Amazon, click here. It’s a new year, a natural time for assessing yourself – reflecting on your past experience, identifying your current abilities and passions, and deciding on your direction for the next year. So do it, do it purposefully, and do it to grow. When I started my graduate school program, I first had to attend an orientation program with the other students who had been accepted as part of that year’s cohort. During those two weeks, we read books, listened to lectures, interacted in discussions and activities, and wrote. And wrote. And wrote. Several of the writing assignments were specifically aimed at helping us to formulate our own personal IDP (Individual Development Plan) for the program, or, what we intended to accomplish and get out of our graduate school experience. One assignment in particular required us to take a variety of personality and ability inventories, to outline our life experiences, and to think through the things that most drew our interest and brought joy and fulfillment, in order to identify our passion and calling. It was this exercise that really helped my to clarify what it was that my experiences, abilities, and passions had prepared me to do, and why those things were driving me. Through this process of reflection and writing, I realized what I loved doing and why I loved doing it, and how I was making a difference, and it confirmed and affirmed in me what I was doing with my life. (For me personally, it was also an affirmation of how God had gifted and prepared me, and what He had called me to do for His Kingdom.) It was a very valuable thought process, one that became a touch point in later years for keeping myself in the place where I best fit. In the years since, I have incorporated a variety of other tools and activities to help me refine my own skill set and passions, and to help me continually improve at what I do. One of those activities is a yearly practice, in December, of listing my major goals for the coming year, and maintaining a list of 5-year goals. The categories that work for me include personal/family goals, spiritual goals, financial goals, intellectual goals, and physical goals. This annual practice is one of the things that helps me regularly self-assess, thinking about what I’m doing, how I’m doing, and what I need to do in the near future in order to grow. It’s now that time of the year when many of us do some self-assessment. We remember what we did (and didn’t) accomplish in the last year. We determine what we might want to accomplish in this next year. We try to make a fresh start. We make New Year’s resolutions. So, as you make your resolutions this year, I would encourage you to be very intentional about this process. Identify your own specific interests, abilities and opportunities. List your own one-year and five-year goals (and put them in a place where you can refer to them regularly). Take advantage of self-assessment tools, such as the Myers-Briggs Temperament Analysis; the One Page Personal Plan (OPPP) from Verne Harnish’s Scaling Up, on the Rockefeller Habits, which incorporates the 5F’s (Family, Faith, Friends, Fitness, Finance); or use a tool that works for you. Regardless of what you use, be purposeful about assessing yourself – reflect on your past experience, identify your current abilities and passions, and decide on your direction for the next year. It’s a new year, a natural time for this kind of review. Do it, do it purposefully, and do it to grow. Happy New Year!